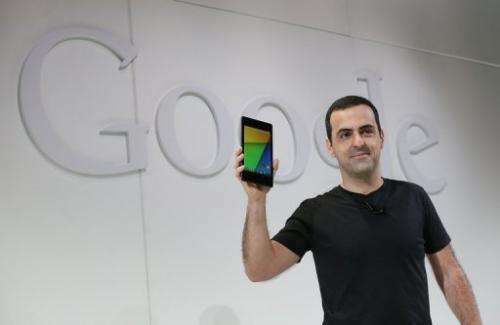 Hugo Barra holds up a new Asus Nexus 7 tablet as he speaks during a special event at Dogpatch Studios on July 24, 2013 in San Francisco. Barra, who was Google's vice president in charge of Android product management, said in a blog post late Wednesday that he is joining China's Xiaomi to help them expand their business globally. China's Xiaomi has poached a key Google executive involved in the tech giant's Android phones, in a move seen as a coup for the rapidly growing Chinese smartphone maker. Hugo Barra, who was Google's vice president in charge of Android product management, said in a blog post late Wednesday that he is joining Xiaomi to help them expand their business outside China, where they already have some market share, but are well behind Samsung and Apple. "After nearly 5 1/2 years at Google and almost 3 years as a member of the Android team - the most amazing group of people I've ever worked with in my life - I have decided to start a new career chapter," Barra wrote. "In a few weeks, I'll be joining the Xiaomi team in China to help them expand their incredible product portfolio and business globally - as Vice President, Xiaomi Global." "I'm really looking forward to this new challenge, and am particularly excited about the opportunity to continue to help drive the Android ecosystem." Android is the Google-developed smartphone operating system that is battling with systems from Apple and Microsoft for dominance in the smartphone market. It is already offered on Samsung and other phones. But Xiaomi has battled in just two years from joining the fight to a 2.5 percent share in the Chinese market, according to Analysys International, on the back of discount prices for phones with high-end features. Xiaomi was co-founded by a former Google executive, Lin Bin.